Bleachers Brew: Sweet Sweep! La Salle claims its fourth Filoil Flying V Premier Cup. Sweet Sweep! La Salle claims its fourth Filoil Flying V Premier Cup. Ben Mbala is a cut above the rest. He is the reason why La Salle is the best college basketball team in the land today. The Arellano Chiefs tried for 28 minutes but at the very end, Ben Mbala and the De La Salle Green Archers were just too much. La Salle turned on the heat in the final 12 minutes of the match to win the Filoil Flying V Premier Cup, 86-74, for their fourth title in this tournament. Mbala shut down the interior, blocking Arellano’s tough forward-center Lervin Flores three times two bridge the third and fourth periods. That left Arellano no recourse but to bombard from the outside. They missed six consecutive shots from three-point range before Jiovani Jalalon knocked one down. But by that time, La Salle was on top, 70-61, with 5:48 to play. The Chiefs led for much of the match led by their backcourt of Jalalon and Kent Michael Salado who harried La Salle’s guards and scrambled for fastbreaks. Arellano led several times by 10 points, the last 35-25, before La Salle made a run to come within a bucket 42-40, at the half. La Salle had its first taste of the lead at 54-52 after an Aljun Melecio layup. Although the Chiefs notched the count twice more, the Green Archers never surrendered the lead. Mbala finished with 28 points and 26 rebounds while Abu Tratter and Jeron Teng each added 13. Jiovani Jalalon top scored with 32 points for the losing squad. La Salle tied National University as the only team to sweep the tournament with a 10-0 record. NU turned the trick in 2012 although they finished with 11 wins. Mbala also shattered the single season scoring record with 225 points breaking former FEU Tamaraw RR Garcia’s previous season high of 201 markers. Mbala also now owns the single game high for blocks with eight rejections. 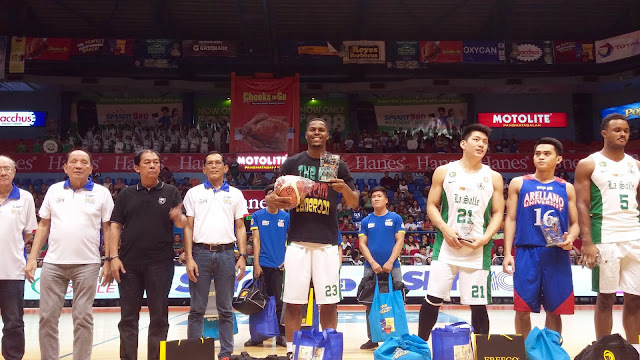 Ben Mbala swept the top awards in the seniors taking the Freego Most Valuable and Gatorade Best Defensive Player Awards. Joining La Salle’s main man in the Gatorade Mythical Five are teammates Jeron Teng (20.8 points) and Abu Tratter (9.8 points) and Arellano’s backcourt of Jiovani Jalalon (19.7 points) and Michael Salado (11.3 points). The hard-luck Ateneo Blue Eagles salvaged a third place finish in the seniors division with a hard fought 66-54 victory over the National University Bulldogs. After a lackluster opening period that saw the Blue Eagles scored only eight points and have more turnovers in the first few minutes than shot attempts (four errors to one field goal attempt), Ateneo righted its ship in the second period with suffocating defense and even more impeccable execution. The Blue Eagles behind second year center Chibueze Ikeh, forwards Thirdy Ravena and Vince Tolentino, and shooting guard Anton Asistio turned the tables on the Bulldogs in the second period by scoring 20-points to the six NU managed. From a 36-26 halftime lead, Ateneo padded their advantage to a game high of 17, after Tolentino hit a triple, 48-31, with 3:28 to play. The Bulldogs cut the lead to eight following a Cedrick Labing-isa jumper, 56-48, with five minutes to play but Ikeh, Ravena, and Tolentino conspired for a 10-6 finish for the final score. Ikeh, playing his best match of the tournament, scored 18 points and grabbed 17 rebounds. Tolentino and Ravena added 15 and 14 points respectively. Just as they have all tournament long, no Bulldog player scored in double digits. In the Juniors Division, the San Beda Red Cubs turned back the Adamson Baby Falcons with steady free throw in the clutch to win the championship, 84-76. The NU Bullpups finished third with an 86-67 win over the FEU Baby Tamaraws. Red Cubs center Sam Abuhijleh was adjudged the Freego Most Valuable Player with 13.4 points and 11.0 rebounds. Joining him in the Gatorade Mythical Five were FEU-FERN’s Kenji Roman (12.4 points and 13.6 rebounds), National University’s John Clemente (15.4 points and 13.6 rebounds) and Rhayan Amsali (12.0 points), and Adamson’s Evan Agbong (12.5 points).